OXFORD, Miss. – Former U.S. Sen. Thad Cochran’s papers will be donated to the University of Mississippi, providing 3,500 linear feet of documents and nearly 6 terabytes of digital files that offer insight into some of the nation’s most significant political events over the past 45 years. Cochran, a UM alumnus, was first elected to the U.S. House of Representatives in 1972, and in 1978, the young congressman won an election to replace longtime U.S. Sen. James O. Eastland, who had retired. This election marked the start of a nearly 40-year career in the U.S. Senate, during which Cochran distinguished himself as chairman of both the Senate Agriculture Committee and the Senate Appropriations Committee, one of the most influential and powerful posts on Capitol Hill. Time magazine dubbed him the “Quiet Persuader” for his polite manner and knack for consensus building. He retired April 1 as the 10th-longest-serving senator in American history. Cochran majored in psychology and minored in political science at Ole Miss, and was the head cheerleader and a member of the Phi Kappa Phi honor society. After graduation, he served in the U.S. Navy and later returned to campus to earn his law degree and serve as editor of the Mississippi Law Journal. While he served in the U.S. Senate, Cochran held many leadership roles, and journalists praised him for his focus on getting things done, rather than playing politics. “These records not only document his years of service representing Mississippi in the U.S. House and Senate, they will also offer future researchers insight into matters of local, state and national significance,” Chancellor Jeffrey S. Vitter said. Leigh McWhite, UM political papers archivist and associate professor, said the senator’s papers would shine light on subjects ranging from wildlife conservation to the return of veterans from the Gulf Wars and also the recovery of the Mississippi Gulf Coast from Hurricane Katrina. The collection includes correspondence, documents, publications, photographs, recordings, scrapbooks and memorabilia, as well as electronic records. The Modern Political Archives is a unit of the UM Libraries’ Department of Archives & Special Collections. Its holdings include the records of Mississippi’s congressional delegation, members of the state Legislature, governors, and federal and state judges. It includes the papers of former Sen. Trent Lott, Sen. James O. Eastland, former U.S. Rep. Jamie Whitten and current U.S. Sen. Roger Wicker. It is a nonpartisan entity and welcomes researchers of all ages and interests. Congressional collections are an obvious resource for biographers examining the life and career of important political figures. However, most researchers who study these records are more interested in examining specific historical topics. McWhite said the scope of subject matter in congressional collections is almost unbelievably immense when one considers all the ways in which modern government permeates society through regulations, legislation, investigation and appropriation spending. “At the same time, these collections allow researchers to examine information on the local scale of Mississippi communities and to study the grassroots opinions of constituents on all manner of subjects,” McWhite said. 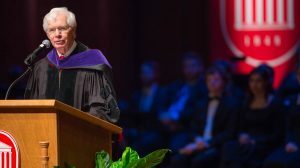 Cochran was honored at Commencement in May with UM’s Mississippi Humanitarian Award, which is presented only rarely to exceptional figures who have played a major role in shaping the state. He is the fourth recipient of the award since its creation in 2001. The university also plans to honor Cochran in November with an event that will raise funds for law school scholarships and faculty support, and the proceeds will also benefit the effort to archive the senator’s papers. For more information about the event, contact Suzette Matthews at suzette@olemiss.edu or 601-937-1497. The law school is looking forward to the event, said Susan Duncan, dean of the School of Law.